Who rang bells at a church in the shire. Since they lived out of sight in the spire. The collisions would make the bells toll. When he slipped, and he tripped, then he fell! All felt sure that his face rang a bell. Like his brother, his name known by none. So the brothers were buried as one. The above was my fourth round entry in Ed DeCaria's March Poetry Madness in which I had to use the word "toll." At some point, I'll share the very peculiar first "toll" poem I wrote, but when I remembered the joke that the above poem is based on - a joke told to me by my father lonnnnnng ago - I wrote again, seeing if I could distill it into 16 lines (at that point, the maximum line limit in the Madness). I think I succeeded, and somehow, I moved on to the Final Four (where voting happens starting today until Monday evening - a line I will remove from this post after voting closes on the two "battles."). If you'd like to get all the poems here at GottaBook - from 30 Poets/30 Days to guest poets, to whatever I cook up - emailed to you for freeee as they hit the blog, enter your email address in the box below then click subscribe! How brave we stand. How unafraid. Sweet songs shall speak of heroes made. Each one but part of our great whole. A truce we offered up – denied! Sudden cheers! Oh, startling noise! A kickball game! Girls challenge boys. The above was my third round entry in Ed DeCaria's March Poetry Madness. My assigned word was "truce" and how I ended up here is truly anyone's guess! I'm still alive and kicking over there with a poem due tomorrow morning in the Final Four. Fun times, and so many amazing poems written by so many. I hope you've been following along! The Poetry Friday roundup is over at my juicy jittle universe today (well, it's actually Heidi Mordhorst's universe, not mine!). Head on over for more poetry fun. And if you'd like to get all the poems here at GottaBook - from 30 Poets/30 Days to guest poets, to whatever I cook up - emailed to you for freeee as they hit the blog, enter your email address in the box below then click subscribe! Does funny trump serious? Does serious trump funny? Is it possible to compare the craft in two vastly different styles of poetry (assuming both are well realized)? Do kids care about the nitty gritty, or is it all about a reaction: a laugh, an emotion, a story? I realize a poetry "competition" is an artificial construct and that final vote tallies are not answers to the above questions since too many factors are in play. Still, in the last two rounds, I've had my funny poems up against a lovely, lyrical pantoum by Susan Taylor Brown and a pitch-perfect free verse poem by Mary Lee Hahn. In both cases, our poems could not have been more different. And I wonder how, if you're a person approaching the poems themselves, you end up picking one over the other. So, I'm curious - do you have a bias towards funny over not? Do you think funny is easier/harder/the same as other types of poetry? Do you, when working with kids, find they have a bias? Do you bring your own bias with you when reading with kids? Every year, during 30 Poets/30 Days, I feature 30 totally different poems and poets... and each one of those poems ends up being someone's favorite of the month. So, I suspect there's no real answer to the conundrum. Instead, we're all just individuals reacting in the moment to what we've read... funny or not. Our entire school library’s empty. It’s bare. It used to be full, but now look: nothing’s there. We’ve got zero books. We’ve got zip, zilch, nil, none. There’s nada. A goose egg. We’ve naught, nix, not one. To help change our null set, please send something for us. We sure miss our books – most of all our thesaurus. The above was written as part of Ed DeCaria's March Poetry Madness (where voting is now open for the "Elite Eight" round (in which I'm still participating!). My word was "zero" which I then multiplied (which in math would give you zero, but above gives 14 by my count). Dad said I’m in charge. Of course, I won’t tell. You tripped? No. You fell. Oh, no! You’ve been cursed! Looks safe. You go first. This poem actually came from one of my prompts at March Poetry Madness... though you won't find the "prompting word" in it. Can you guess which one? Anyway, it never worked in well, though I quite liked the poem! 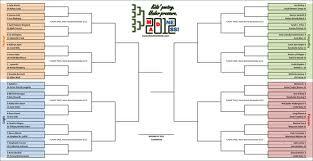 Voting for many poems is ongoing at The Madness - right now including my own poem in epic poetic battle with a pantoum! Good stuff. I hope you'll check it all out. In a comment over at Think Kid, Think, someone equated the current March Poetry Madness event to the Hunger Games. I think that's right on - 64 poets go in, lock in battle, and only one remains at the end. I'm currently matched up against Susan Taylor Brown in the round of 16. I hope you'll check out my epic acrostic using "truce" vs. her lyrical pantoum using "impaled" and cast a vote. And check out all the action there for more excellent poetic fun. Now I’m wired, wired, wired. The Poetry Friday roundup is over at A Year of Reading (where co-host Mary Lee Hahn, still alive and kicking in the Madness, shares one of her fab poems). Why not check out all the poetry goodies today? Turns out: my co:l:on’s: spastic:::! This poem was inspired by March Poetry Madness at Think Kid, Think (specifically a single word from it used as a prompt!). If you'd to get all the poems here at GottaBook emailed to you for freeee as they hit the blog, enter your email address in the box below then click subscribe! I’m like a spinning top. That’s why we often fight. I’ll shine and shine all night. I think that I’m just me. Thanks to all of you who voted (for me and my poem Wake Up Call or for anyone) in the first round of Ed DeCaria's March Poetry Madness. It's a really fun event... and I'm excited that I've moved on to the round of 32. My next poem will be up Monday morning, but I can't tell you what it's about since I haven't yet received the word I have to use for it! In the meantime, there's great reading up at Ed's site, and other poems coming up for voting Sunday morning. I hope you'll check it out. Good times! The above poem was the first one I wrote based on the word I got in the first round - wired. I eventually submitted a totally different poem, but I thought it would be fun to share this one, too. Plus, I just announced the 2012 Edition of 30 Poets/30 Days. I hope you'll be following along, as the poetry in April is going to be fantastic. I'm hosting the Poetry Friday roundup today! If you have a post you'd like to share, please leave a link to it in the comments, and I'll update the roundup throughout the day. Here at GottaBook, I announced the 2012 edition of 30 Poets/30 Days. Every day in April, I'll be sharing a previously unpublished poem by a different poet... and when you see the list in that post of who's joining in the fun, I think you'll agree it's going to be a great month. At Ed DeCaria's Think Kid Think, he's hosting some March Poetry Madness! There are already 64 poems on display for reading and, in some cases, voting. And there will be more sooon. You gotta see the great work folks are doing. And yes, I'm participating, as are many folks who hang around this blog. Go read. Vote if you'd like. And keep coming back as the competition goes on. 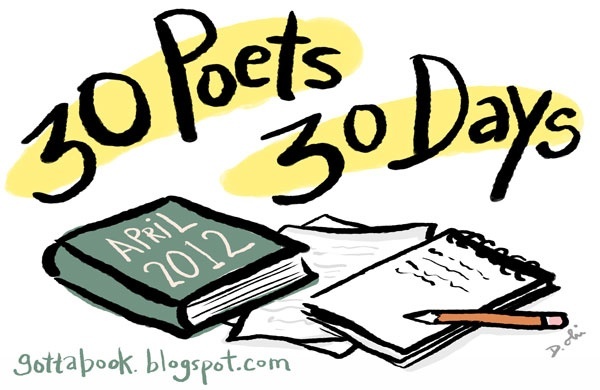 Announcing the 2012 Edition of 30 Poets/30 Days! 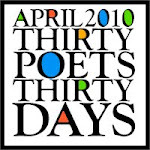 I'm so excited to announce the 2012 edition of 30 Poets/30 Days, an annual celebration of children's poetry that takes place here at GottaBook throughout April (National Poetry Month here in the U.S.). Yeah. I'm excited. Like, really excited. I'm so grateful to the poets for joining in to share with you all, and I know we're gonna have a great month of poetry fun. There are a few easy ways to follow along and not miss out. You can visit here every day. Sweet! You can subscribe to GottaBook via email or your blog reader. That list runs year round, by the way, so whenever I post a poem here, whether it's my own or a poem from a visiting guest poet, you'll see it. Plus you can join the fun on Twitter - follow me for links to the poems every day (and much more), or follow @30poets30days for purely poetry tweeting. There are always folks to thank with a big event like this, so let me start by thanking the incredibly talented Debbie Ridpath Ohi for this year's logo. I'm amazed by the talent of this year's poets, yes, but I am in awe of Debbie's skills - a logo here, a picture book there, hilarious cartoons, prose, songs, social media how-tos. I mean, it's kinda unfair... except that she's a part of 30/30 now, so I'm just plain grateful. I also want to thank all the poets who've joined in prior years of this event, thus making this year possible. And, of course, I have to thank all of you who read along and share the poems and the event with others. April is going to be a blast. I do hope you'll stick around! Oooh! You can vote for me! There is a TON of great poetry going on at Ed DeCaria's March Poetry Madness. You can read it all and vote for lots of contests still going on. It's a really fun event, and whether I advance or not, I know I'll be reading 'til the end. Who’ll pay me to go pro? If you haven't been following along about what's happened in Tucson with the shutting down of the Mexican-American Studies program in their schools, you really should hurry over to Deb Reese's American Indians in Children's Literature blog for fantastic coverage - updates from teachers and students, perspective from other corners, and more. This is a story worth understanding, and her coverage is the best I've found. On the lighter side, Ed DeCaria came up with a fantastic and wonderfully loopy idea: a March Madness event featuring 64 poets! I'm in, man! The way it's gonna work is that we'll each get a word assigned to us... then we'll have 36 hours to write a poem. Then there's voting to move on in the bracket. It's a tough game - I'm matched up against Dave Crawley! Yikes! But it's all in good fun, so no worries. There will be 122 new poems created during the event, so bookmark Ed's site to follow along. I’ve got nothing to share. Or write a new haiku. My words are stuck like glue. The Poetry Friday roundup is up over at Gathering Books today. Go on over and check it out. 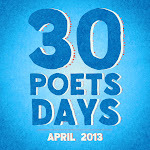 Did you know that there's gonna be a new edition of 30 Poets/30 Days here at GottaBook in April? Well, there is. 30 new poets. 30 new poems. One fabulous month. Come back on March 16th for more details. But, hey, there's nothing wrong with a little tease! I saw Dr. Seuss' The Lorax yesterday. I went to it, I admit, with a bit of dread - prior adaptations have been disappointing, to say the least, though the Horton movie was pretty good fun. I also come at this from a screenwriting point of view where I know that the writers simply HAVE to make major changes to create something that sustains for 80+ minutes. I expect that going in, so my issues are rarely with the fact that things are changed. It's usually in HOW they are changed. 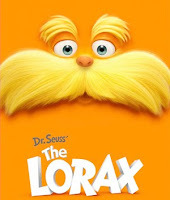 The Lorax falls into that category, too, though I must add that I didn't find the movie egregious in its approach at all, as opposed to the ad campaigns touting environmental goodness and using the Lorax as a seal of approval. Not buying it for a second, thanks. But that is NOT the movie. Phil Nel talks of this distinction in his review, and I concur... though I don't give the movie a B+ like he does. I think that's too high, though the movie's beautiful and has some fabulous moments, too. Anyway, my first comment is smallish, I realize, but I'd never heard Truffula Trees pronounced "Truff-you-la" before. In the old Lorax animated special it was "Truff-ya-la" and I've been known to say "Truff-a-la" also. But "Truff-you-la" as it's said in the movie? Huh. Beyond that, what struck me in the film was both its embrace of the source material AND what seemed like a need to distance the movie from the book, too. To wit, the film starts with the Lorax breaking the fourth wall to tell us in the audience that the real story has more than "what's on the page." OK. That sets up the fact that we're in for a different experience. 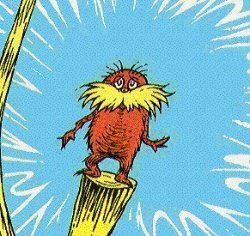 It's a good framing device, because the opening scenes of the movie are not related to the Lorax story we all know, though it soon becomes clear how it ties in. 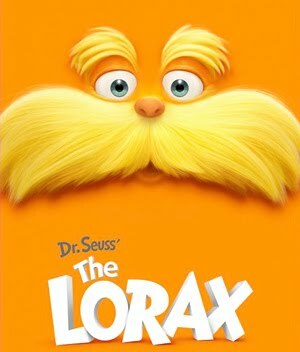 I'd also note that this is about as active as the Lorax gets, just like in the book - he moans and is a presence but doesn't do much, a real challenge for the filmmakers, no doubt. Within the movie itself, there are clear references to the book... but only sometimes. And even then.... For example, a character uses the line that the tufts of the Truffula trees supposedly smell of "fresh butterfly milk." But then there's a dismissive "what does that even mean?" throwaway line! Ouch. That's a come here-get away moment that distanced me from the characters. 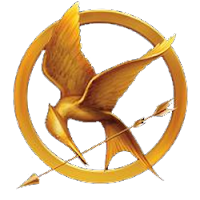 Again, if one is not a fan of the book, it probably doesn't matter at all. To me, though, it was off-putting and unnecessary and speaks to this weird tension between the media. Another moment that comes to mind - the Lorax lifting himself by the seat of his pants and disappearing. Why, I wonder, couldn't the filmmakers have had him give a "sad, backwards glance" as he left? I didn't see one. Perhaps I missed it, of course, as it's not like I was watching the movie looking for "off" moments. Still, while I recalled him looking at the Once-ler then, I don't recall the glance... and I wish I did. The moment worked, by the way, just like in the book. I'm just left wondering. Some of dialogue in the movie had rhyme in it, but many lines began like parts of the book then veered away as if they couldn't commit. I can only imagine the struggle of how to embrace the rhyme and rhythm of Dr. Seuss in the script - the dialogue can't all be like the book, as people don't speak that way, after all. And yet, couplets did come out of folks mouths from time to time, almost all written for the movie, not taken from the book. Why those lines? Why not others from the source itself? I am unsure, but watching the movie, I noticed it. Of course, I also have read The Lorax aloud so many times, I know it far better than most. But still, for me, that was an issue. The bottom line is that the movie is fine - sometimes way better than fine, sometimes not. There are musical numbers which I found them lacking the magic of the best Seuss songs - really, now, you don't name a character in a final moment just so his name creates a rhyme! And nothing in the movie compares to the sewer pipe song in the original animated short. Or or or. Yet, at least the numbers were there to move the story along NOT just to have a pop soundtrack. And certainly, love and care was put into the movie all along the way and that shows, too. I didn't love it, it's true, and I have quibbles and issues galore, but was I entertained? Yeah, for the most part I was. And I'll take that. And you? Did you see it? Did you love/hate/enjoy/walk out of/laugh/sing? I'd love to know! It's been a long time since I've posted or re-posted an Oddaptation here. For the record, Oddaptations are kinda SparkNotes of picture books... except they're in rhyme and with a "pointed point of view." The Poetry Friday roundup is over at Dori Reads today. 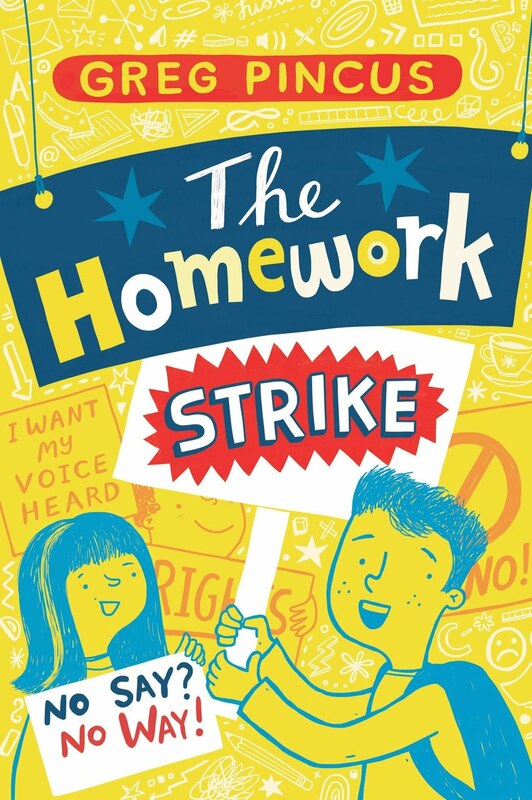 Head on over and check it out (including Dori's fine, fine interview with Laura Purdie Salas who has TWO new poetry books out). If you'd to get all my poems, including the Oddaptations, emailed to you for freeee as they hit the blog, enter your email address in the box below then click subscribe!